An identical card, with the same message, is held by HALS. 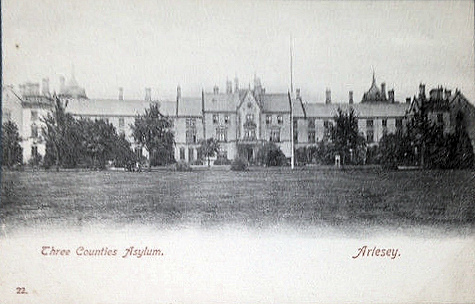 The Herts County Asylum at Hill End, St Peter's Rural parish, was erected by the County Council for patients belonging to unions in the county of Herts, and was opened 7 April 1899; two new wings were added in 1908, and the asylum now provides for 830 patients. The estate comprises about 225 acres, and adjoins the Hill End station of the Great Northern railway. Hill End Hospital was erected by the Hertfordshire County Council; the estate comprises about 580 acres, and the Hill End railway station, Eastern Region, adjoins it; the hospital was opened in 1899; two blocks were opened in 1909 and another in 1917; further additions were made 1934 and 1939, making the total capacity of the hospital 1,232 patients. Monochrome photographic print mounted on board, 268 x 213 mm. 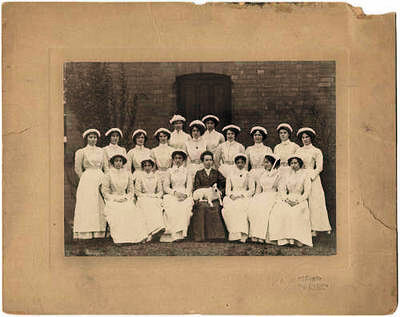 Group of nurses in uniform, Hill End Hospital, St Albans, 1904. Detail from 6" to 1 Mile Ordnance Survey Map circa 1920.
for information on the other long stay mental hospitals in the area. with information on surviving records, etc. 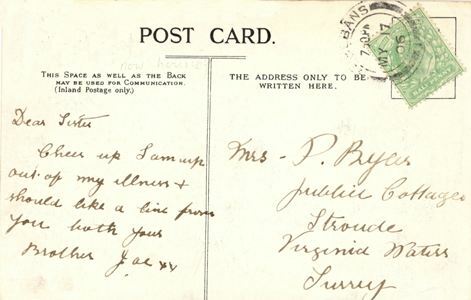 Barbara Jeffery (barbjeffery @t hotmail.com) from Australia writes: My mother was sent to Hill End Hospital in the mid 1940s to recuperate following surgery at St Bart's in London. All the other patients seemed to be there for similar reasons. Even padded cells had been converted into post-op wards! Unfortunately, whilst there, my mother caught scarlet fever - quite serious in those days. She always wondered what had become of the mental patients during this period, or had only a portion of the hospital been used? 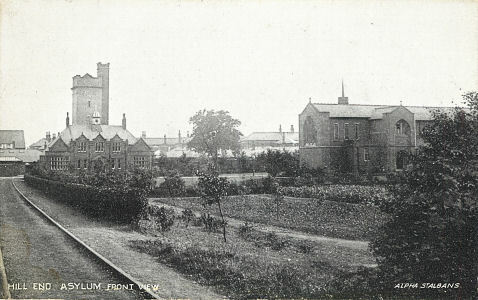 A view of the asylum, taken about 1904, looking at the North Fron. The entrance building and offices can be seen in front of the Water tower while the chapel is to the right of the picture.